I’m not a great cg sculptor but thanks a lot! It’s a great feature, I’m sure! Your hard work is really helping me tonnes. I hope your involvement with sculpting will be a ongoing in the future as the resent developments you have done are crucial, I hope the blender development fund will support you permanently to advance sculpting. I can finally switch from zbrush to blender sculpt, (with a little compromise). Thanks a lot Nicholas !!! Thats something :D big thx Nicholas! where u can mask and create a new model out of the masked region? Not quite sure what you mean — what would the new model being created be? Although it’s not as smooth in Blender, you can do this in edit mode. 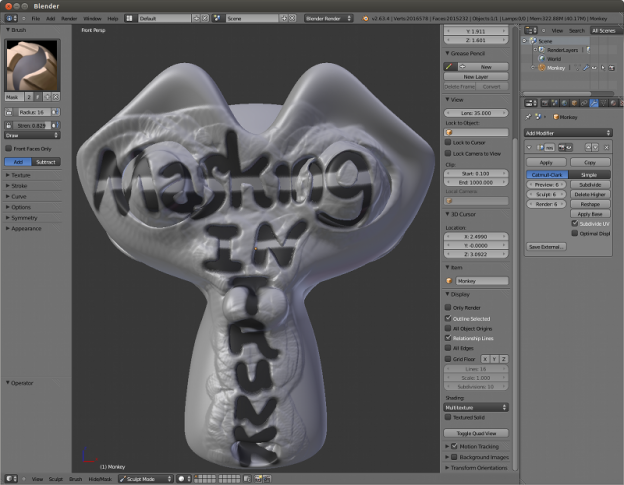 You could even define the shape in sculpt mode with a mask, then hide the rest of the mesh. The hidden parts would be hidden in edit mode too, so you could then duplicate and separate the remaining faces, creating a new mesh. thats right ofc we do have some other ways of doin things similar to that way in zbrush. Thanks a lot Nicholas, great work, I would like to know if you plan to implement the mask layers and the texture to mask operator as well, it will be awesome to have these features too in trunk. These are both possibilities, although not until 2.65 at the earliest.